The white city of Tangier, situated in Morocco, between the Mediterranean Sea and the Atlantic Ocean, is the gateway to the continent of Africa; a cosmopolitan town which has been a place of inspiration for many artists and intellectuals. Located a few miles from Spain, the two continents are separated at its narrowest point, off Tarifa, only 14 kilometres and offer magnificent views of the Strait and a fantastic light worthy of being enjoyed. Because of this proximity, a trip to Tangier gives us the opportunity not only to immerse in another completely different culture, but also get into the African continent. Visiting Tangier with an organized tour can be a great idea to maximize our time on the Costa del Sol. Thus trips to Tangier from the Costa del Sol, for a day or several days, are a popular package among travellers taking advantage of holidays and time off in Malaga. Who has had the opportunity to explore the white villages of Andalucia, will notice right away the Moorish style in the whitewashed houses, an Arab heritage that has been preserved for centuries on the European side of the Strait. The old town of Tangier is very similar, with a maze of narrow streets, small houses, old buildings, a castle and small shops. We find both traditional houses and European-style buildings, lush gardens, monuments and palaces, as well as the modern part of Tangier with large buildings. The Kasbah and Medina are among the main attractions of Tangier. For entry to Morocco you need a passport valid for at least 90 days. The national currency is the Dirham being 11 Dirham = 1 Euro. Prices for the excursions to Tangier start at 66€ from 1 day and up to 3 days trip with hotel included for 160€, with weekly departures from Malaga on Tuesdays, Wednesdays, Thursdays and Saturdays throughout the year. 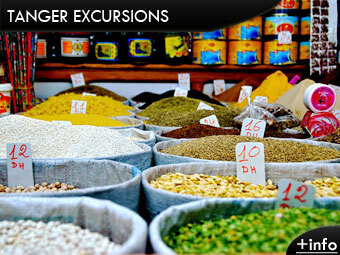 What is included in the excursion to Tangier? Among many other things are included the ferry and of course the obligatory travel insurance. Accommodation is included in price for those trips to Tangier longer than one day. A passport or identity card is mandatory for your visit to Tangier for all EU travellers, and if you are visiting Tanger from outside EU, you may need a Visa. If you plan to go during the winter to Tanger do not forget to bring warm and rain proof clothing. During the summer, wear light clothing and a sun hat. The use of comfortable footwear and clothing is always recommended when you visit Tangier. If you are or think you are sensitive to sea sickness, do not forget to take some pills for the trip by ferry from Algeciras to Tanger. Where can I book an excursion or tour to Tanger? We recommend to book your trip to Tangier in advance to avoid availability problems. Transfer Malaga airport to Tanger: For you, your family or a group of people. Check prices and different options from Malaga airport.